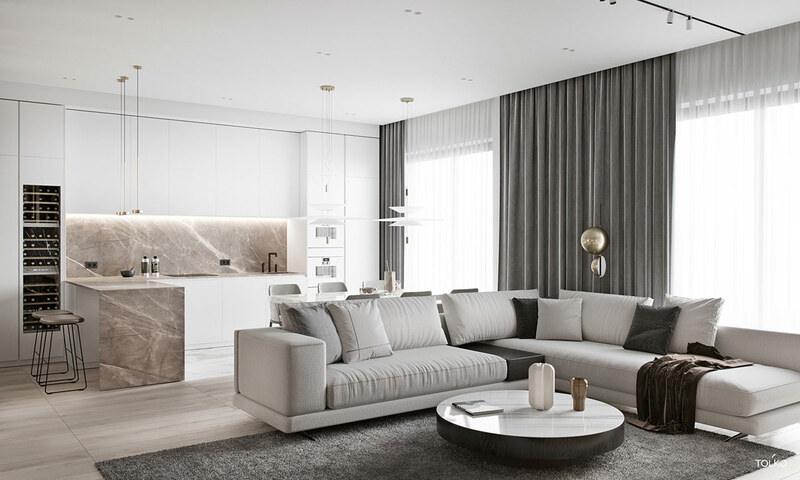 This is the ‘Almond Flat’ project, a 160 square metre Russian home in Saint Petersburg, designed and visualised by TOL'KO interiors. 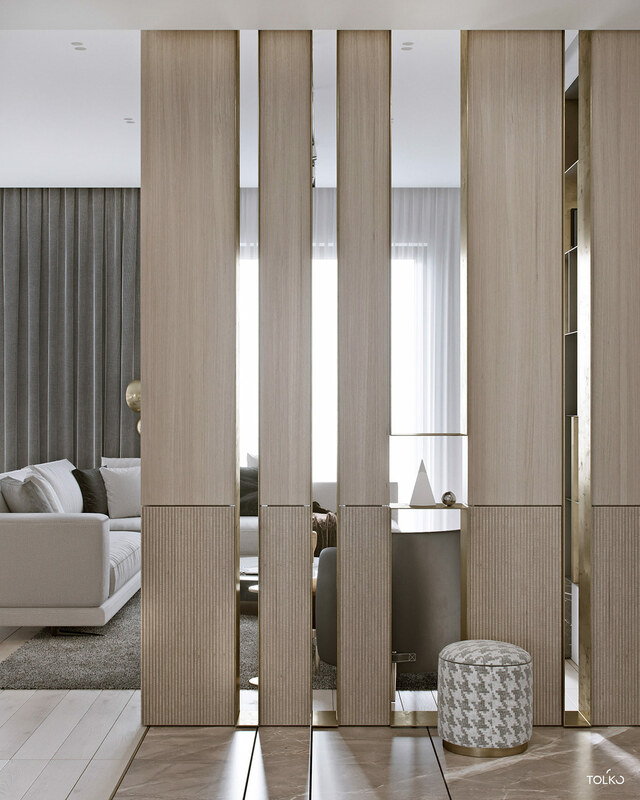 It is a home of light neutrals and modern ideas, with bespoke storage, luxury feature walls and high-end furniture. 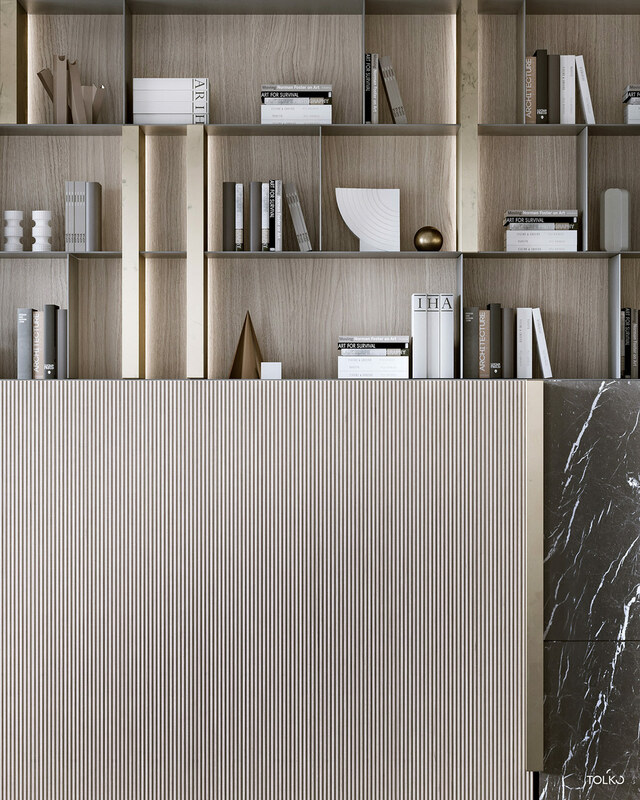 Amongst these you will find a sleek tv hideaway unit clad in marble, wood and gold. 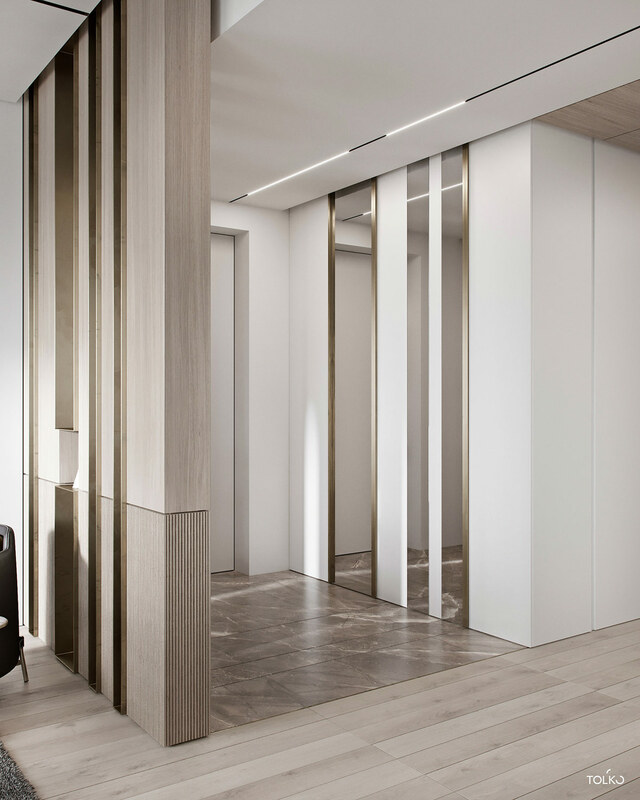 There is a cutaway dividing wall fashioned with textured panelling, metallic trims and a cunning use of mirrors. 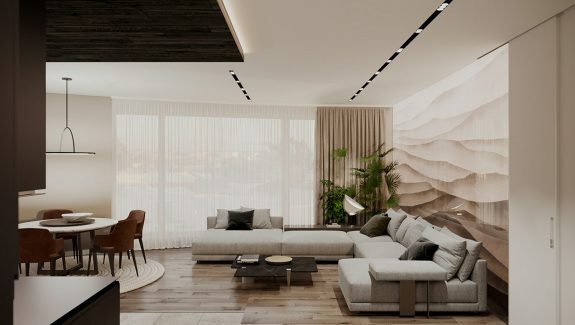 Light tracks and ceiling panels define different spaces. 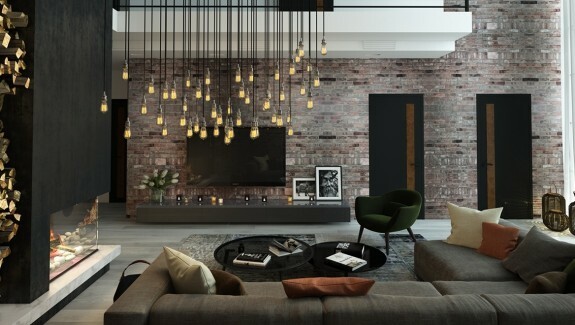 Dramatic lighting evokes an intriguing ambience of mystery and quiet decadence, and softly illuminates the neutral colour story and natural materials that thread through each and every room. … the mysterious volume reveals a secret flat screen tv hidden inside, after its wood ribbed panel is slid out to the left. The concealment prevents the tv from being the main focus of the living room, like it is in so many modern homes. Hiding the technology away encourages one to seek out literature before idly channel hopping. Ambient lighting glows inside each volume of the bookcase, inviting you in to choose a new adventure. A luxury chair and footstool set sit conveniently right by the shelves, providing a comfy place to sit and read one of the many books. There is a tiny side table nestled beside the modern accent chair, which is just big enough to hold a refreshing drink. Interesting objects and ornaments break up the wall of books to keep the display looking characterful. A track of directional lighting has been positioned to highlight both the wall shelves and the modern sofa. In the centre of the lounge area, a round coffee table keeps a low profile. A couple of decorative vases make it more of a focal point. Behind the sofa stands the dining room and a one wall kitchen with a peninsula. 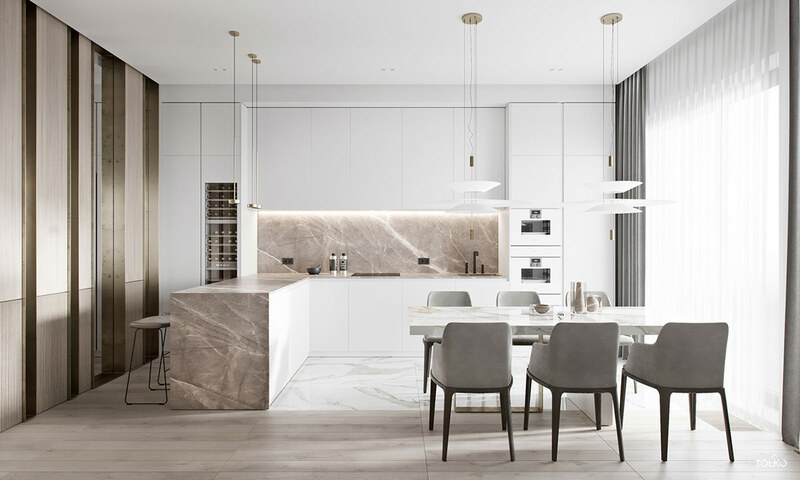 Two white dining room pendant lights have been suspended over the white marble dining table. 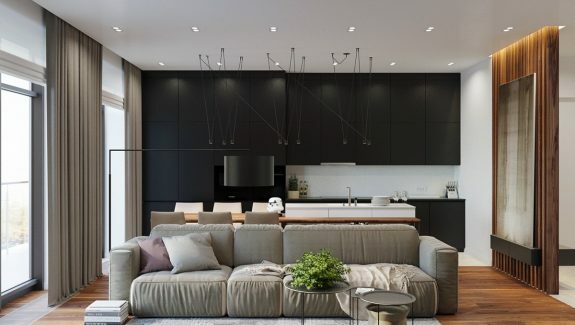 The large lights not only illuminate evening meals but also help to visually anchor the six seater dining set firmly in its spot in the open plan. A more casual dining area has been fashioned along the kitchen peninsula by adding in a couple of kitchen bar stools. Perhaps this is more of a wine bar though – as a towering wine rack takes up residence right beside it. A stylish little houndstooth fabric stool hangs out in the home entryway behind a dividing wall from the living room. The diving wall is a custom design that features cutaway columns, which are lined with gold. A combination of smooth wood slabs and wood ribbed panels clad the volumes. A small shelf furnishes one of the gaps that open through to the home entryway. The same column design is repeated on the other side of the room beside the kitchen diner, though on this side the gaps are cunningly filled in with mirrors to create an optical illusion. 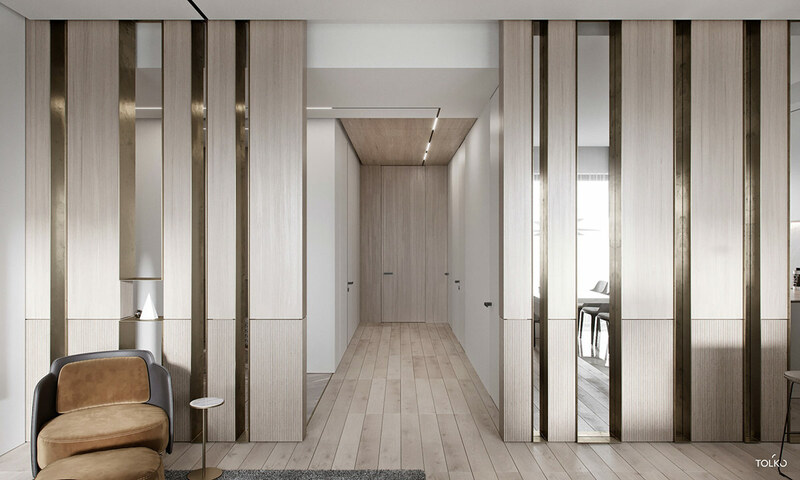 Mirrored panels decorate the entryway. Marbled tiles streak the floor. Track lighting draws out a path along the ceiling, leading from the front door to the bedrooms and bathrooms. 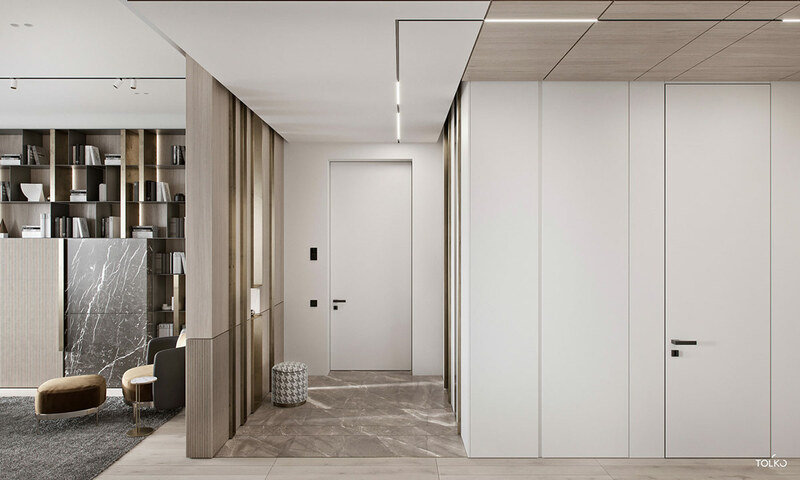 The plain white ceiling in the entryway changes to wood panelling on the approach to the private quarters. The partial divide allows natural light from the lounge windows to enter the hallway. 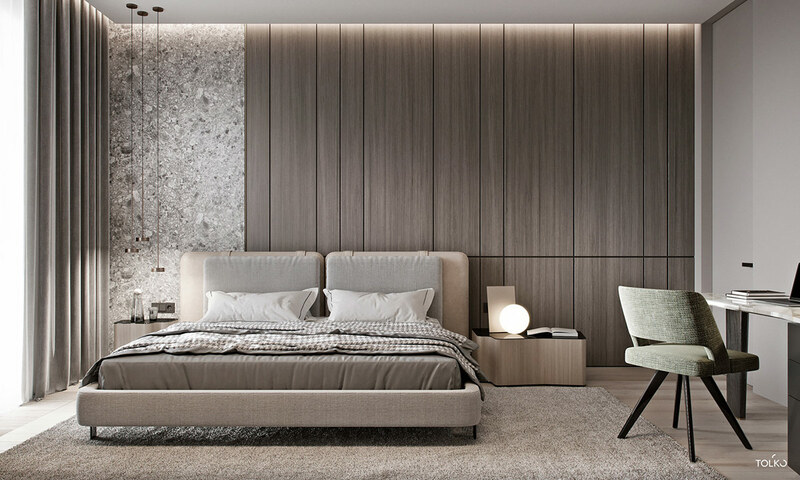 Panels of granite and wood create a headboard feature wall in the bedroom. 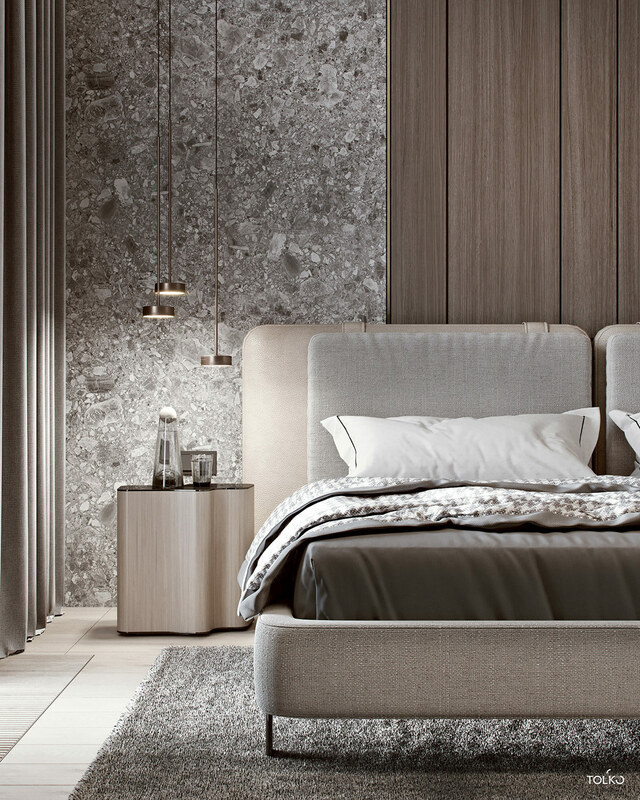 A trio of tiny pendant lights ensure the luxe granite treatment is unobscured at one bedside. An orb bedside table lamp glows brightly against the dark wood tone on the other side. The bedroom pendant lights dangle over a freeform unit; the unique carafe you see here is the Fia carafe. 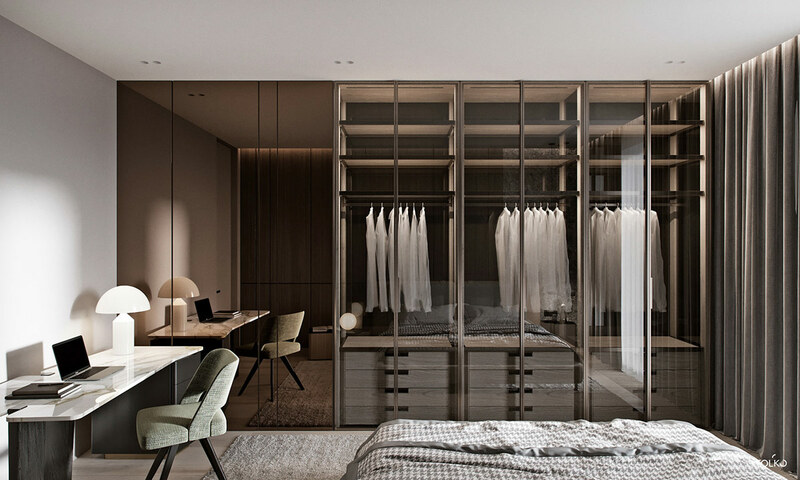 Glass closets stand opposite the foot of the bed, with chests of drawers included within. 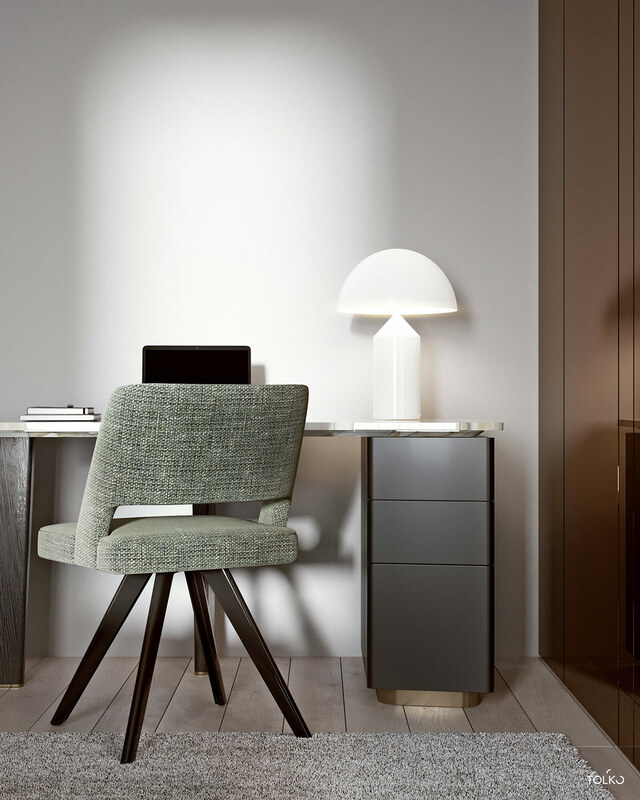 A modern desk and swivel chair sit nearby, lit by a white Atollo lamp. Cheaper replicas are available on Ebay. 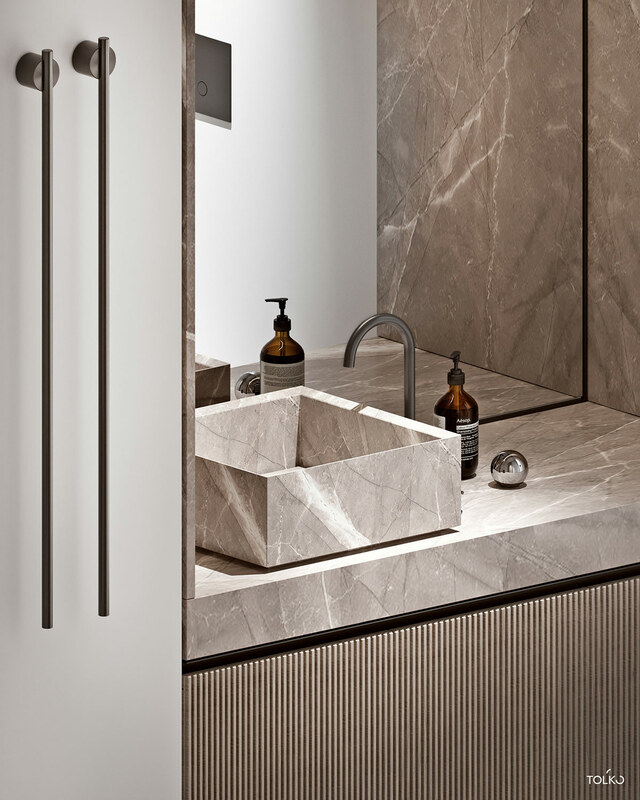 A marble wraparound defines the vanity area in a luxury bathroom design. 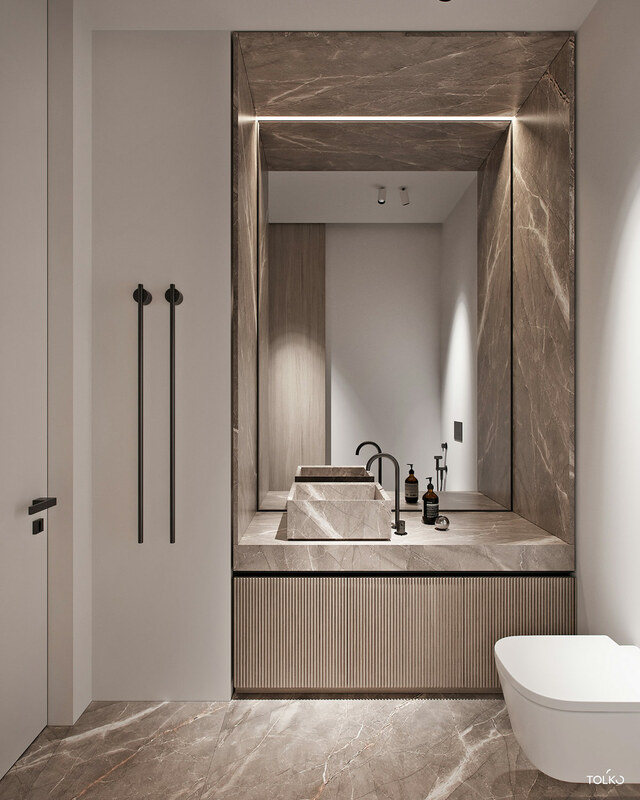 Wood ribbed doors conceal storage underneath the vanity, and a marble basin sits on top. 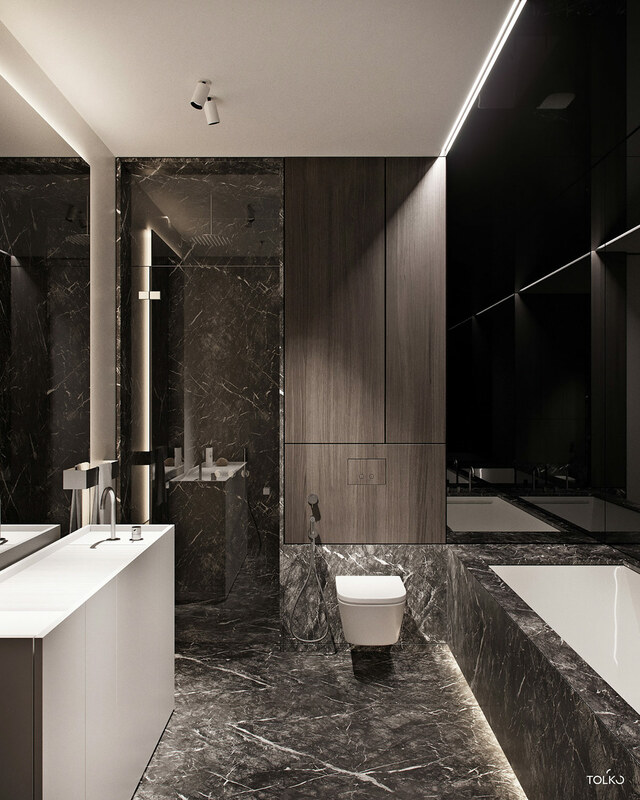 Black fixtures punctuate white walls in the remainder of the bathroom. 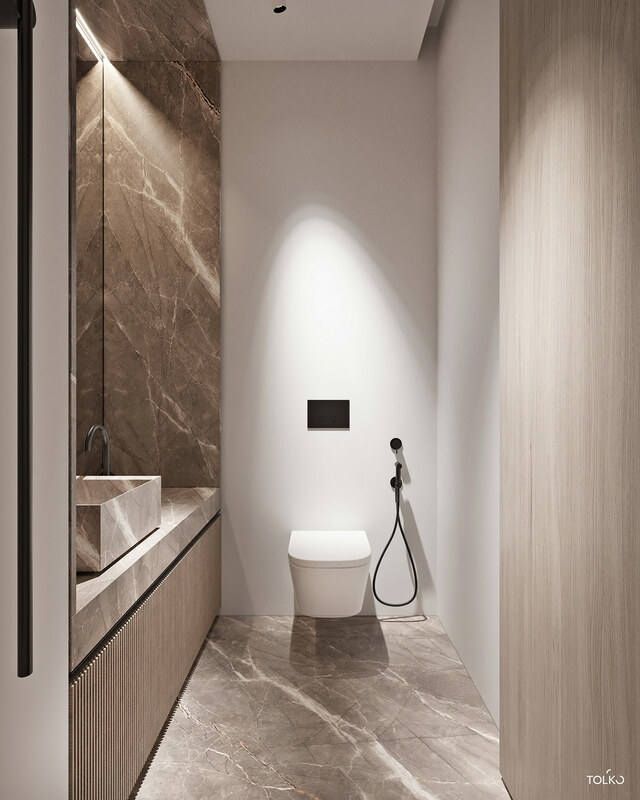 A wall hung toilet keeps the floor area looking spacious. A freestanding nickel tap feeds the marble vessel basin. The mirror is a custom cut piece that fits edge to edge in the vanity area recess. 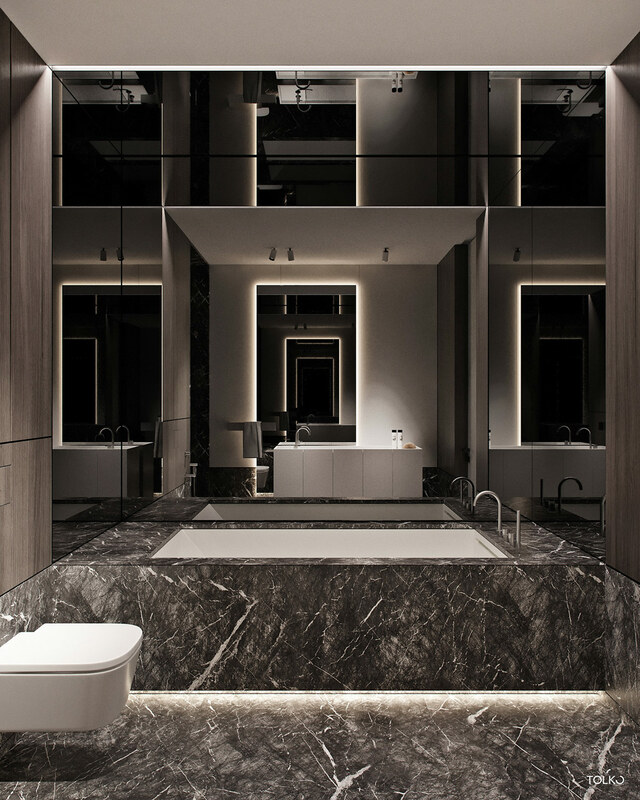 Another bathroom is clad in black marble, which covers the floor and heavily boxes in the bathtub. 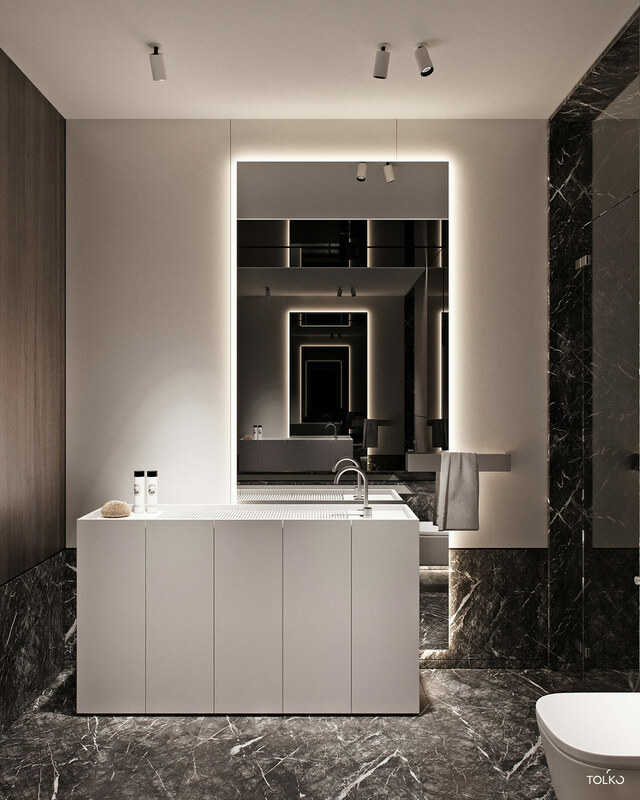 Bathroom mirrors mounted on opposite walls create an infinity effect in their reflections of each other. There is a freestanding white vanity unit on the other side of the room, which has a contemporary integrated shallow basin design. The toilet flush plate has been disguised with a wood effect finish that blends with the wall. 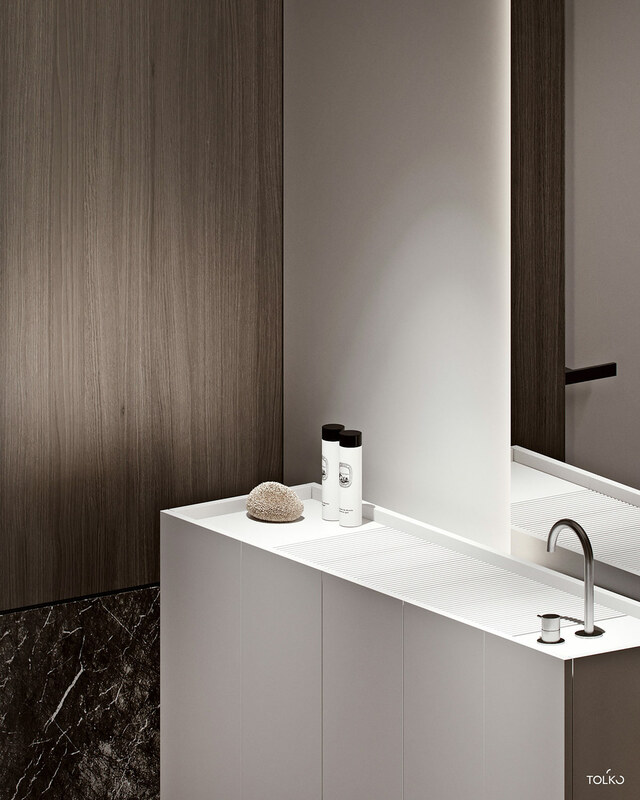 The shallow grid style basin has a solid plane at one end, designed for standing soaps and lotions, or minimal decoration.